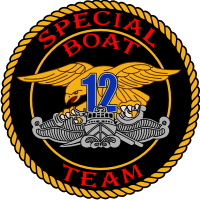 Special Boat Team-12 was established in Oct. 2002 as a result of NSW Restructure force changes. The Unit is located at Coronado Amphibious Base, San Diego Calif. The Team is comprised of MKV SOC and SOC RHIB combatant craft. The Team deploys its SBDs to North East Asia, South East Asia and the Middle East. Special Boat Team began its history as Boat Support Unit ONE in 1964, in 1971 it became Coastal River Divison-12, and in 1978 it became Special Boat Unit-12 This long established history has had the Team continuously serving with distinction in almost all of Americas conflicts since Vietnam. SBT-12 was a frontline unit in IRAQI FREEDOM in 2003 and continues as a frontline unit in the Global War on Terrorism .